New Interested Families, please read the Parent Letter posted on the Parent Resources page. 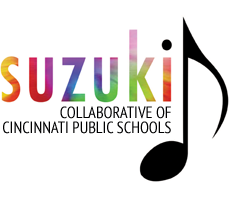 The Suzuki Collaborative of Cincinnati Public Schools is a non-profit organization composed of students, parents and teachers trained in the Suzuki methodology and philosophy. Founded in 1984-85, we are the original Suzuki Program of the Cincinnati Public Schools (CPS), formerly known as C.O.P.S (Cincinnati Organization of Parents for Suzuki), and the Suzuki Cooperative of CPS. Copyright 2017 — Suzuki Collaborative of Cincinnati Public Schools. All rights reserved.